I Was a Semi-Retarded Fratboy! is in its SEVENTH week in theaters and has passed the 400 million dollar barrier and is close to cracking the Top 10 all-time list. We are currently working on our section for the upcoming Red Flag Productions drama titled The Project and are outlining a script for a co-production with Dcope titled Click. After Click and The Project are completed, we are going to focus on two other writing deals: Utopia, from Fly on the Wall Studios, and Particle Man from F2 Films. We have also signed on with Atticus Pictures to participate in a yet-to-be-named horror anthology. Our creative design department will be creating the poster, website and art for this one. VP CHOICE NOMINATIONS. Suburban Films received 20 direct and 2 indirect nominations during the VP Choice nominations period. Nominations included Best Film, Best Producer, Most Promising Producer, Best Comedy, Best Mystery/Thriller, and Best Studio Website. 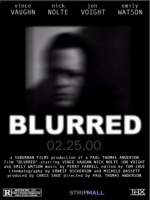 Blurred received a total of ten nominations, while Chunky! received seven. A total of nine acting, two directing, and two casting nominations were also received. We are also contributing to VPNews - columns, stats, analysis, etc..
02.23.00 Appearance on The Late Show.